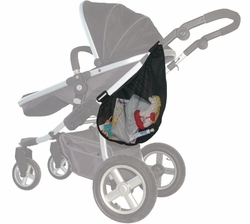 The Jolly Jumper Saddle Bag fits most strollers and attaches easily to either side of stroller frame. It elasticized large opening helps you for quick & easy access. adjustable, non-slip straps.